Cox Roofing Systems evolved from Stan Cox Insulation Contractors. It began in 1976 as a Urethane Foam Insulation Company and was incorporated in 1980. The insulation company eventually morphed into a full-fledged organization offering its unique roof system as Cox Roofing Systems in 1990. We primarily serve the Toronto, Southern and Northern Ontario regions with industrial and commercial roofing, but have completed projects in many other areas too including the Arctic, Labrador and the Northwest Territories. Dealerships are currently being installed through out Ontario and Canada to meet demand. We were family owned and operated until 2014 where Wayne Cox took sole ownership. We have always been and continue to be dedicated in providing well-trained, experienced personnel. 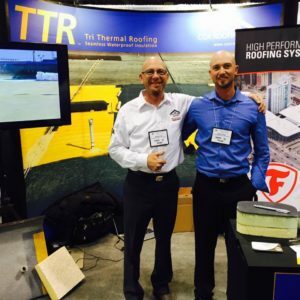 The founder is Stan Cox – a respected veteran in the roofing business for over 35 years and President of the TTR® systems used by Cox Roofing. Cox Roofing Systems is committed to safety, quality and high environmental standards. Employees go through mandatory training and each individual on the team meets all safety and certification requirements. This commitment ensures that your staff, and ours, remain safe and that you receive the best quality product – a product we stand behind with our 10,20 and 30+ year warranties. Our goal has always been to produce the best most energy efficient roof system available. From the beginning, because of our background as an insulation contractor, we have been concerned about the total payback of the roof. The longer the roof performs and the more energy it saves each year, the less expensive it becomes. A roofing company that offers you a quality product that we guarantee! The patented TTR ® system brings all our knowledge together to create a truly energy efficient roof. The high-R-value spray applied Polyurethane insulation provides lightweight, energy efficient insulation on top of the existing roof. Next, the fully adhered EPDM membrane provides a level of protection that is superior to traditional coatings and does not require fasteners or primers. Along with the great environmental benefits of the TTR® System, further energy savings can be achieved through Roof top landscapes and Photovoltaic panels that can be installed over top of the system with full warranty. Our system is also available with a black membrane or white energy star rated membrane.